A few days ago reigning U.S. cyclocross champ Stephen Hyde was lying on the floor in his basement, stretching. Hyde tried to sit up, but his body would not budge. His phone was out of reach. His fiancée Hayley was away at work. Stephen Hyde is one of the fittest professional cyclists in the United States, but at that moment, he was as helpless as an infant. Eventually, Hyde gritted his teeth, pivoted his legs, and pulled himself off the floor. “It hurt like hell but I did it,” Hyde told VeloNews. The ordinary task of standing up — let alone riding a bicycle — presents a challenge to America’s best male cyclocross racer these days. Stephen Hyde is recovering from a fractured sternum, one of those injuries that inflicts constant pain. It hurts when he breathes, when he eats, and when he gets out of bed. Race a bicycle? Forget about it — Hyde is sidelined for nearly six weeks due to the injury. Hyde suffered the injury on September 30 at the World Cup opener in Waterloo, Wisconsin. 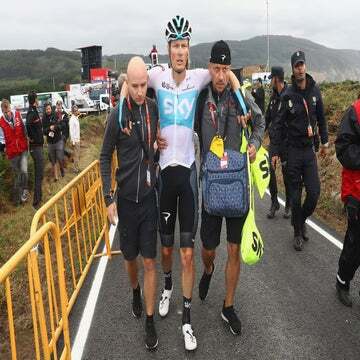 He went down in a major crash just a few moments after the start, in the most hectic moments of the race. Hyde was following former worlds medalist Lars van der Haar (Telenet-Fidea). As the Dutch rider sped into an off-camber section, his tire slipped out and he crashed. Hyde couldn’t avoid the collision. Hyde heard a popping sound during the crash. He picked himself off of the dirt and felt pain — he assumed he had broken a collarbone or a shoulder blade. As Hyde checked his body out, nothing felt broken until he tried to get on his bike and couldn’t support himself on the handlebars. His day was done. Hyde pulled out of the race. The injury was a huge blow to Hyde’s early season goals. He said he was on better form for the early World Cups than he’s been in years. Instead of traveling to the next round in Iowa, Hyde took an early flight home. A CT scan revealed the broken sternum. So what is Hyde going to do? He plans to ride the stationary trainer and prepare for his comeback. In fact, on Tuesday he logged three hours indoors. “Look for me on Zwift,” Hyde said, laughing. 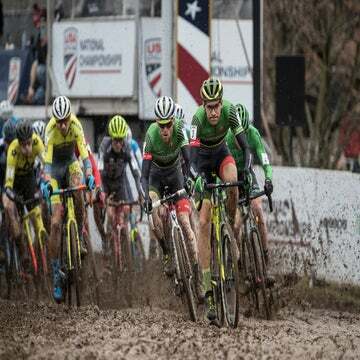 The crash is a major setback for Hyde’s cyclocross season, which only runs about five months, September through January. Hyde hopes to be ready to race in time for the Cincinnati race weekend, October 27-28, or Pan-American Championships in Canada the weekend after, although he wants to be ready to race to win. “I’m certainly not going to show up to let anyone take it away from me,” he said. Hyde won the 2017 Pan-American title in Louisville, Kentucky. For someone who has faced myriad setbacks in his early career from Lyme disease to depression to debilitating knee tendonitis, Hyde said he is keeping a level head and an optimistic outlook. He’s even drawing on the setback to motivate him for the second half of the ‘cross season. “This happens so often — and not just to me, to a lot of people — it happens to everyone at some point,” he said. “The big point I can’t stress enough is that it’s just part of your journey.